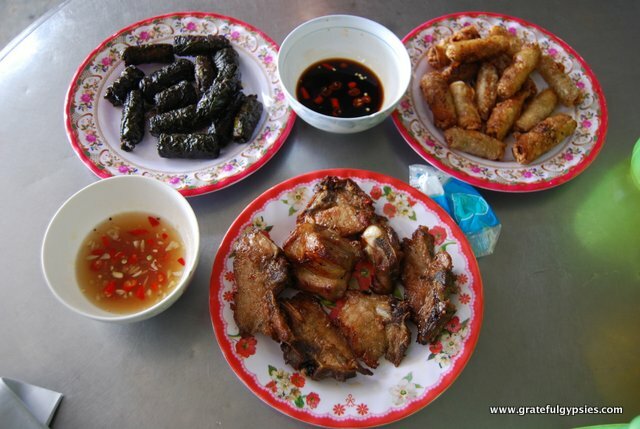 Planning a month-long cross country trip in Vietnam is no easy task. 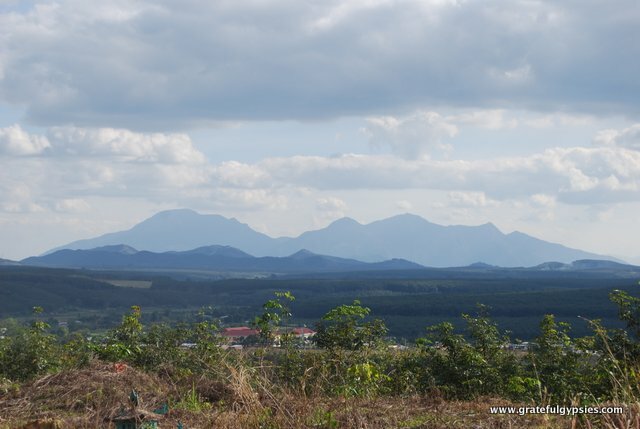 It’s a very long stretch of land with so many places to see and things to do. There was one thing, however, that was high atop our list long before we even sat down to hammer out the details – a motorbike trip of some sort. 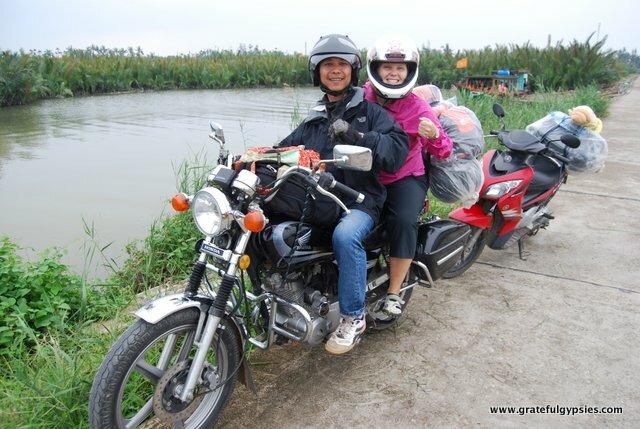 Easy Riders is a motorbike tour company that will take you anywhere you want to go. While one of the backpacker staples is buying a used bike, riding it down the coast, and reselling it in one of the major cities, we decided against this for various reasons. We’re traveling with a lot of gear. Neither of us knows the first thing about fixing or repairing bikes and spending most of our precious month in the country sitting on a bike didn’t seem appealing. We did our best to research this trip beforehand, as it is a big investment when you consider the cost of traveling in Vietnam. While we were in Hoi An, we got in touch with the guys who are supposedly the “real” Easy Riders. Their idea for our trip sounded good, but they weren’t exactly flexible or easy to communicate with. It even got to the point where we gave up on the idea entirely. That is until the folks at our hotel mentioned that they knew a local guide who could actually meet us face-to-face. This sounded much better than working out the details through e-mail, so we rung him up and he was at our hotel within half an hour. Mr. Chinh showed up with a big smile on his face and he set out walking us through the options with a detailed map of the country. We decided that we’d go ahead and sign up for three days up front and then reassess the situation on the road. With the details worked out, we agreed to head out the next day. In the morning, he was waiting for us downstairs with two motorbikes ready to rock. Rachel would be riding on the back of his big boy motorcycle, while I’d be riding my own scooter. After strapping all of our gear to the bikes, we set off from Hoi An. On the way out of town, we made a few pit stops. First up, we visited his home a few miles from the town. His wife and two children were there, and we all had some tea and snacks together before hitting the road. Next, we stopped to check out some coconut palms where Viet Cong would hide out during the war. Hiding spot for the VC during the war. We made a quick stop at the beach outside of town. 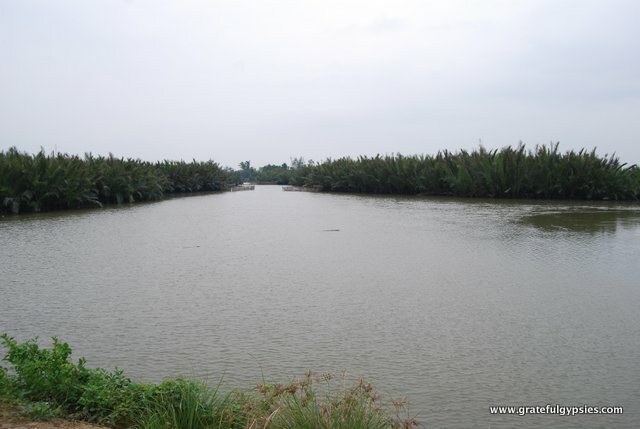 As it was a bit cold and windy, it definitely wasn’t swimming or sunbathing weather, so we jumped right back on the bikes and cruised out of Hoi An. From there we visited a local farm, where I tried my hand at watering the crops. Needless to say, I wouldn’t last long as a Vietnamese farmer. 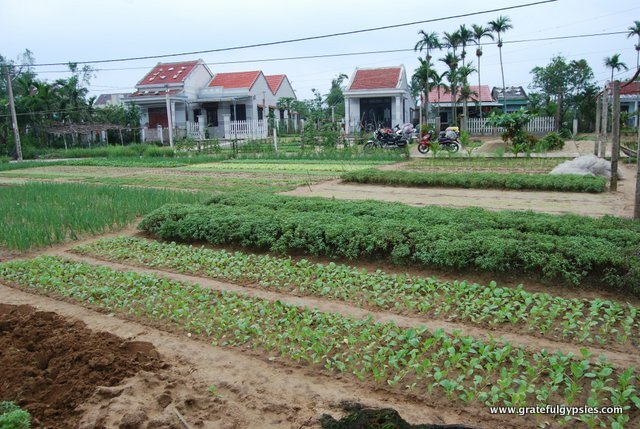 A small farm outside of Hoi An. Back on the road, we pulled over to take a look in a shop where the owners use pieces of bombs left over from the war to make things like drums and vases. Although the war has been over for many years, there are still signs of it all over the country. 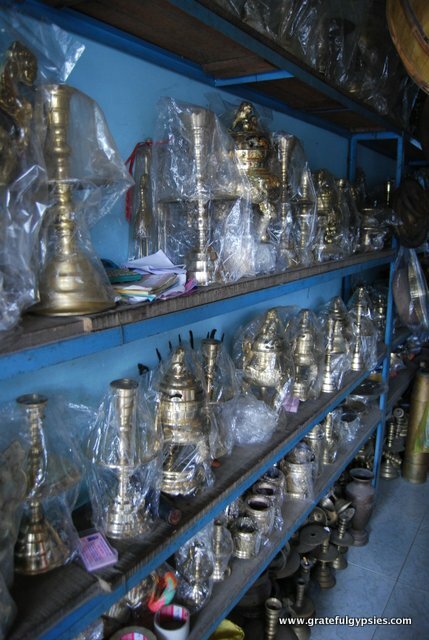 Goods made from the remnants of American bombs. 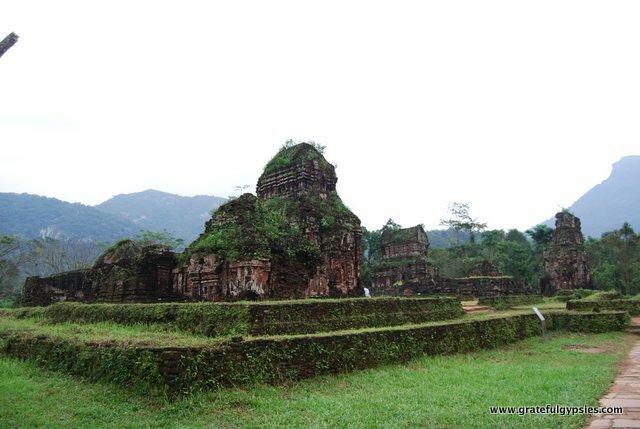 After about an hour on the bike, we reached My Son – a set of ruins built by the kings of Champa who once ruled Vietnam. We enjoyed leisurely exploring the ruins for an hour or so, and then we sat down for lunch with Mr. Chinh and got to know each other better. Wandering around the ruins of My Son. With bellies full and a nice caffeine rush from strong Vietnamese coffee, we got back on the saddle and rode through some stunning countryside. Watching farmers tend their crops with water buffalo and children playing in villages with no tour buses in sight was wonderful, and it felt great to finally be seeing some of the real Vietnam. Plowing the fields in the central highlands. 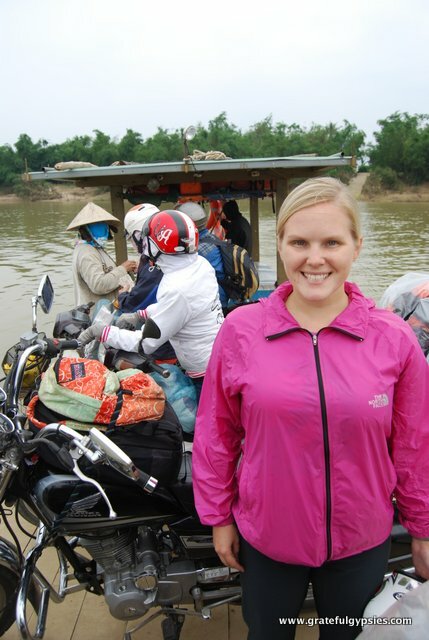 To continue on our journey, we had to board a small local ferry on the bikes and cross a river. I was a bit worried that I would accidentally gun it and end up in the water, but luckily I managed to maneuver the bike onto the boat and we all made it across safe and sound. Crossing the river with our bikes. Our last stops for the day were a pineapple farm and a minority village. Our guide told the villagers that we were Dutch, as he said that the only country other than Vietnam they knew was America and chances are they did not have favorable opinions of us. In total, there are 54 ethnic groups in Vietnam, and we got to visit a few of them during our trip. With the sun going down, we ran into some rain and had a fun time putting on our full-body rain jackets. Eventually, we pulled into Kham Duc, where we checked into a hotel, enjoyed dinner and some beers, and took a walk around town together. We finally learned where pineapples come from! Children in the village enjoying some cakes we brought. 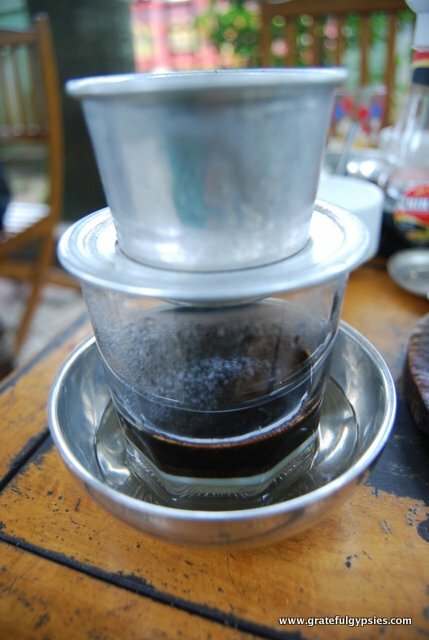 In the morning, we sat down for breakfast and more potent Vietnamese coffee. The cups are small, but don’t let them deceive you – it’s strong stuff and if you put down three cups you may be shaking all day. 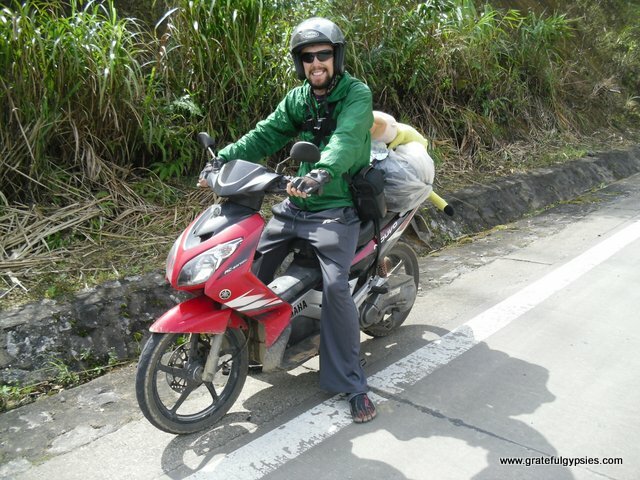 Mr. Chinh strapped the bags back on the bikes, and we set off for another day of cruising through the beautiful central highlands. 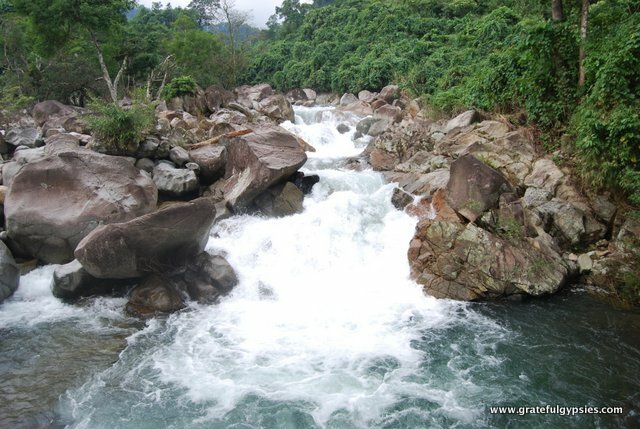 Our first stop of the day was a rushing waterfall where we got to relax for a few minutes and enjoy the scenery. This is one of the best parts about doing an Easy Rider tour as opposed to doing it yourself – the guides know the roads like the back of their hand and can lead you to some stunning spots that you otherwise wouldn’t find. Stopping by a waterfall for a while. Our guide doubled as a photographer. This part of the country is incredibly beautiful, and taking it in from a motorbike was much better than being crammed in the back of a bus. We took our time and pulled over to the side of the road quite often to stretch our legs and snap photos. View from the back of Mr. Chinh’s bike, Rachel’s perch for four days. 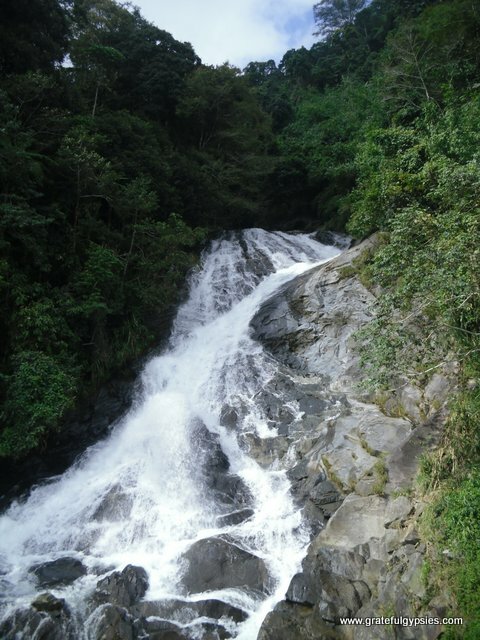 Yet another waterfall. We actually climbed to the top of this one. Eventually we found ourselves in another minority village, where we explored the communal rong house that is used for meetings and celebrations. 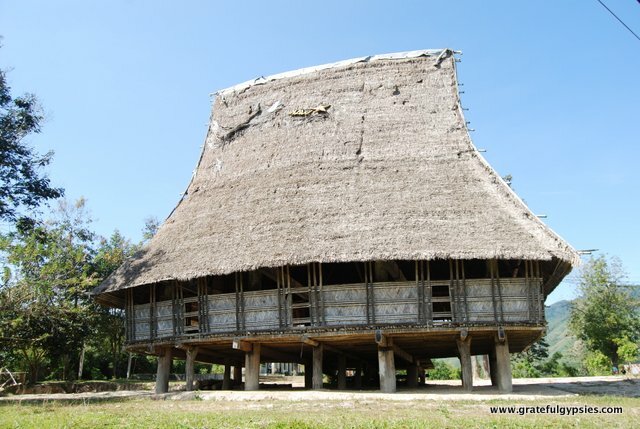 A communal rong house in a minority village. When doing an Easy Rider tour, everything is included in the price except for meals and drinks. This was no problem, though, as we all went Dutch on every meal. As the guide is paying for his own food, you can expect them to take you authentic local joints with tasty food and a low price tag. On our second day, the three of us enjoyed an amazing meal for just a few dollars each. A tasty meal for a few bucks. In the afternoon, we had quite a busy schedule. 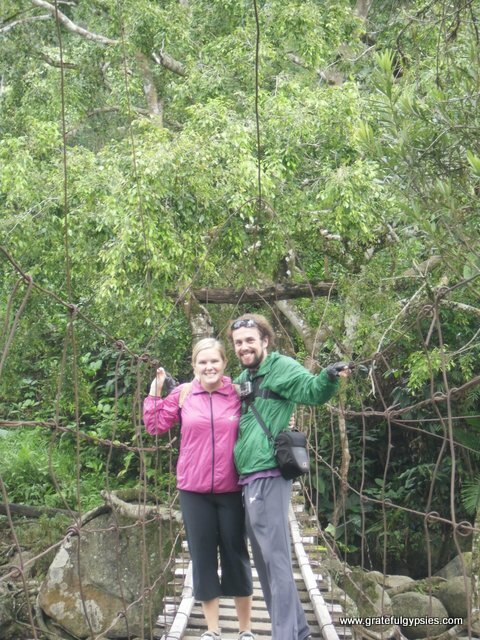 First, we came to what Mr. Chinh called the “scary bridge.” He insisted I go first so he and Rachel could take some pictures. I obliged, and barely made it across the rickety bridge. On the other side, I was waiting for them to cross until I realized that the whole point of the stop was for me to cross the bridge only to come right back. Next, we stopped to take in the views at the frontier area. From here, you can see out to the spot where Vietnam, Cambodia, and Laos meet. Looking out from the frontier area. 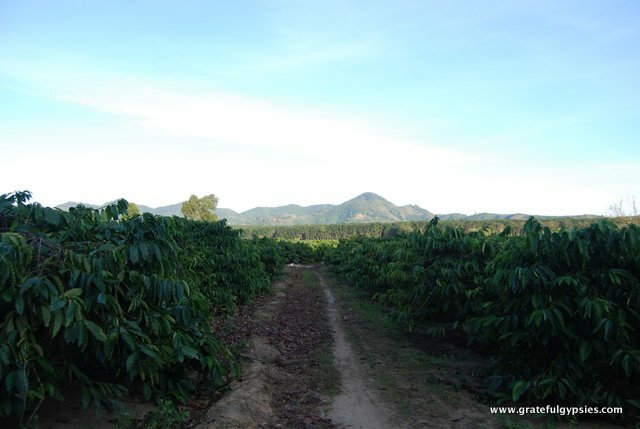 Next, we visited a few different farms, where we learned how Vietnamese farmers grow cassava (tapioca) and coffee. We also visited a massive rubber tree plantation. It was interesting to learn how all of these things are grown and to see the farmers at work – something us city slickers know nothing about. 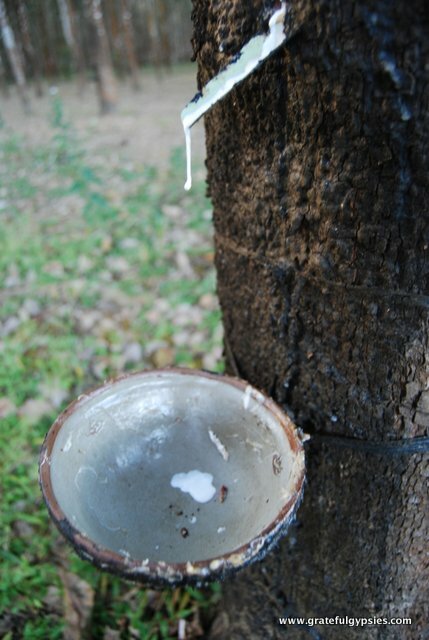 So this is where rubber comes from! A coffee plantation out in the Vietnamese countryside. Our last stop for the day was a small square in the town of Dakto. On display are two tanks used by the Viet Cong, as well as a patriotic statue of the people celebrating. Once again, we realized that the war remains an important part of daily life in Vietnam, whereas we barely ever reference it back in the US. Mr. Chinh insisted that we pose on this tank. A short ride from there landed us in Kontum where we would spend the night. Our accommodations for all three nights on the trip were all quite nice, as we always had our own room with hot water and even WiFi. After a power nap, the three of us went into town to grab some dinner and of course some cold beers before calling it a night. Home for the night just outside of Kontum. Believe it or not, the journey is only half-way finished! 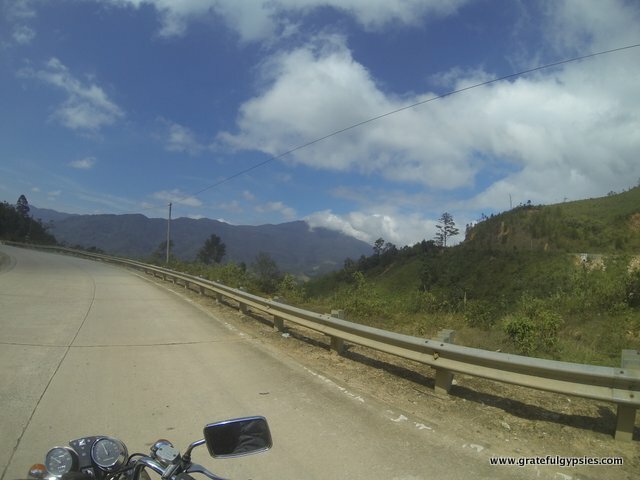 Keep on cruising and read part two of this awesome motorbike adventure.